It has been two decades since master filmmaker George A. Romero`s zombies have scared the audiences around the globe. For years, fans have been eagerly awaiting his return. And now the day is here. A new chapter of horror has arrived. Now that zombies have taken over the world, the living have built a walled-in city to keep the dead out. But all`s not well where it`s most safe, as a revolution plans to overthrow the city leadership, and the zombies are turning into more advanced creatures. 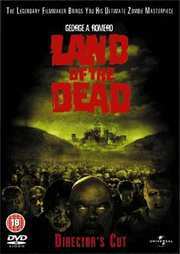 George A. Romero`s Land of the Dead is the acclaimed director`s long awaited return to the genre he invented with Night of the Living Dead in 1968. You can view the trailer <a target="_blank" href="http://www.nmm-trailerpark-hst.com/Land_of_the_dead_snif.html">here</a>. Undead Again: The Making of `Land of the Dead`. A Day With The Living Dead. Bringing The Dead To Life. When Shaun Met George. The Remaining Bits. Bringing The Storyboards To Life. Scream Tests: Zombie Casting Call. Scenes of Carnage. Zombie Effects: From Green Screen To Finished Scene. Feature audio commentary with director George Romero, producer Peter Grunwald and editor Michael Doherty. All i can say is keep up the great work George!